Thanks to our dedication to providing our customers with the best moving and storage services in the Bay Area, Metropolitan Van & Storage has officially retained our A+ rating from the Better Business Bureau (BBB). Based on BBB criteria and our history of excellence, our recent re-accreditation has ensured our high standing through February 2017. Our Bay Area moving company is thrilled to have been able to achieve and continually maintain this honor through our hard work and dedication. What Makes Metropolitan Van an A+ Business? Length of time business has been operating – Because our Bay Area residential moving company has been in business since 1963, the BBB views us as sustainable and legitimate. Complaint volume filed with BBB for business of this size – When you’re a top-tier moving company, complaints are unacceptable. It’s our job to provide our customers with incredible moving services, and we go above and beyond to do so. Because of this, there was only one customer throughout all of 2015 that had a negative experience. Response to complaints filed against business –One unsatisfied customer is one too many, so we did whatever we could to make up for this particular customer’s negative experience. Resolution of complaints filed against business – We were able to successfully close the complaint against us, mending our relationship with the customer while showing the BBB how dedicated we are to providing quality services. 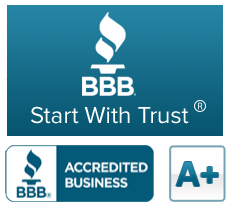 Our mission aligns with that of the BBB: advancing marketplace trust between consumers and businesses. We want our customers to trust that we will do whatever it takes to make their moving experience free of any stress. By continuing to provide quality services, we hope to uphold our A+ rating for years to come. For more information on our Bay Area household movers, or a free in-home estimate, contact us today. Give Metropolitan Van & Storage a call or fill out our online form to receive your free quote!